Long haul flights from Heathrow to Australia, the Far East and South Africa are having to make unscheduled stops to take on more fuel. A Qantas flight to Sydney on Friday will refuel at Stansted because of rationing at Heathrow after the fire at Buncefield oil depot in Hertfordshire. 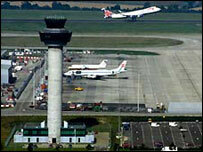 Other airlines have said their long haul flights will have to make similar stops at overseas airports. The Buncefield depot is said to supply a third of the fuel for Heathrow. Some aircraft are only being allowed 40% of the fuel they would normally take on board and airport company BAA said restrictions could last some weeks. Qantas said its flight to Sydney via Bangkok at 2145 on Friday would have to stop at Stansted in Essex, adding about an hour and a half to the journey time. A spokeswoman said only that flight was affected but it was too early to tell whether similar journeys on subsequent days would have to make the same refuelling stop. South African Airways, which flies from Heathrow to Johannesburg and Cape Town said it also expected one of its evening flights to make a refuelling stop. Tony Astle of BAA said: "Clearly the loss of one third of our fuel supply is having an impact on us but with the co-operation of all the airlines, Heathrow continues to operate normally. "Fuel demand at Heathrow is now approximately the same as the fuel that is being supplied into the airport, so the operations are unlikely to see any serious delays and the situation is improving hour by hour and day by day." Gideon Ewers of the International Federation of Air Line Pilots' Associations (IFALPA) said only long haul flights would be affected, but it would cause disruption for passengers. He said: "The flying time between Heathrow and Stansted is only about 15 minutes but it will add longer than that to flights. "You have to stay on the ground for at least 30 minutes after landing, so I would guess it could add an extra two hours on every flight. "That could have issues with people making connecting flights and there will be a little bit more passenger disruption than people expect." Mr Ewers said the fact that planes were having to make an extra landing and take off would have implications for aircraft maintenance and crew working hours limitations. British Airways said the situation was having no impact on its operations. It said it was putting more fuel than normal onto its flights into Heathrow to avoid using up so much of the fuel available at the airport.